In April 1917 both the Essex Yeomanry and the 1st Essex were among the British Forces near Arras tasked with taking the large village of Monchy le Preux. The successful operation has become a legend amongst both units as both performed heroically. The Essex Yeomanry lost 135 men plus most of there horses. Lance-Corporal Harold Mugford won the VC. 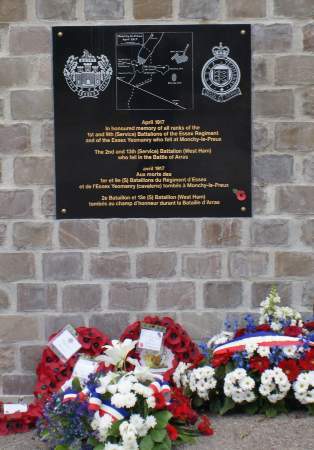 On 21 May 2016 following a campaign by the Western Front Organisation a memorial to both Regiments was unveiled at Monchy le Preux. Click here to read about the Essex Regiment at Monchy le Preux.